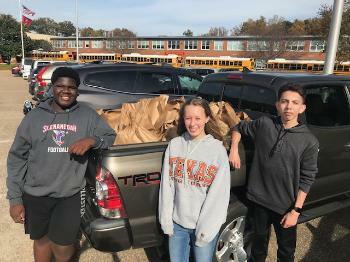 The QMHS National Junior Honor Society sponsored a food drive for the local food pantry. Signs were posted and each teacher encouraged their classes to bring in non-perishable food items. Ms. Arcuni visited all the middle school classrooms to speak about the shortage of food in our neighboring communities. Teachers acted as mentors to students, encouraging "giving back," with a goal towards promoting well-rounded students with an eye towards citizenship, one of the precepts for the National Junior Honor Society. QMHS students and their families showed just how giving they are with a collection of over 600 food items.